Transportation startup Lucid Motors is working on an electric car to rival the Tesla Model S, and it just announced plans to build a $700 million manufacturing facility to bring it to fruition. 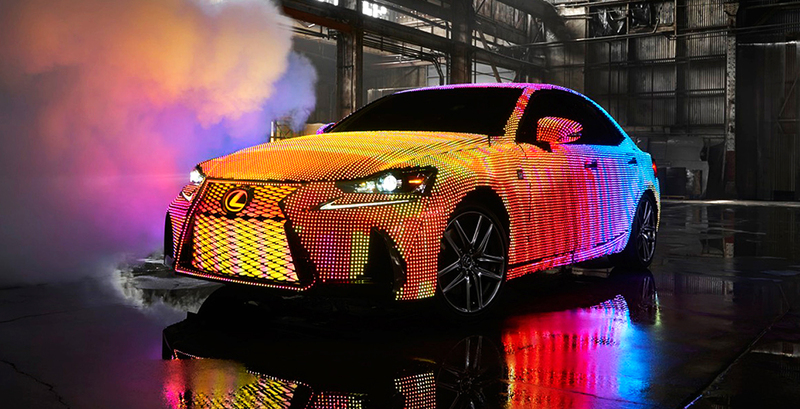 Meanwhile, Lexus unveiled a mind-blowing car covered with 41,999 LEDs that can change colors at a whim. Could the solution to congested streets lie in subterranean tunnels? That's the idea behind these crazy CarTubes, which could move city traffic underground. Four major cities around the world pledged to ban diesel cars by the year 2025, and UPS just rolled out its very first e-bike delivery vehicle in Portland, Oregon. Germany's massive Wendelstein 7-X stellarator is attempting to harvest energy from the incredibly intense reaction that powers the stars, and according to recent reports it's actually working. In other energy news, researchers at the University of Surrey are working on super batteries that could charge cell phones in seconds and electric cars in minutes. Google is driving a hard green line: It says it will run on 100-percent renewable energy by the end of next year. Myanmar launched a new program to provide all of its citizens with solar power by the year 2030, and Leonardo DiCaprio schooled Donald Trump on the benefits of renewable energy. Architecture is incorporating technology in exciting new ways, and the buildings of the future are out of this world. Architect Saul Ajuria Fernandez has developed a solar-powered Droneport that could serve as a hub for flying delivery vehicles. Singapore's latest skyscraper is a latticed tower that will one day be completely covered with living plants. China-based People's Architecture Office developed a $10,000 tiny house that can be assembled in a day with a single hex key. And America's first urban "agrihood" is feeding 2,000 households in Detroit for free.